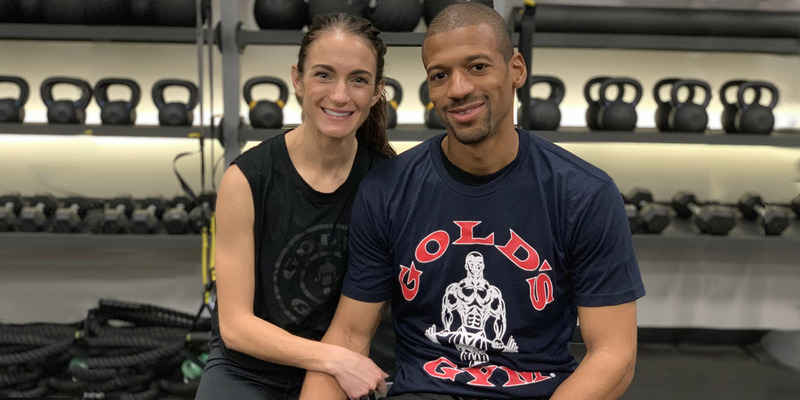 Power couple Ronnie and Shelli Franklin use their partner workouts to feel good about themselves individually so they can encourage and motivate each other. “We both use fitness as a balance to hectic schedules and changes in life,” Ronnie says. See the pair take on this workout from Gold’s Gym Fitness Expert Andy Coggan. Facing your partner and holding a medicine ball at your chest, begin doing a high shuffle to the side by taking a big lateral step and follow with your back foot moving to the side. Complete the lateral shuffle 10 yards throwing the ball back and forth to your partner as you go, and reverse direction for another 10 yards to get the other side. Use a light medicine ball (4-10lbs) and stand about 5 feet away from your partner as you shuffle. While facing one another with 1 foot between both of you, each partner holds a plank supported with arms fully extended and body in a straight line from head to toe. From this base, both partners will perform a push-up, return to the starting position, lift their right hand and reach toward the opposite shoulder of their partner. Put your right hand to the floor, complete another push-up and then repeat the reach, this time using your left side. Start in a squat position with your feet shoulder-width apart and your arms extended parallel to the floor facing your partner. Swinging your arms down and back, jump as high as you can, and high five your partner at the top and come down with your knees bent. Jump again with no rest. Begin with your partner in a plank position on their hands, facing away from you. Stand between your partner’s feet and hold their legs by the ankles as you position yourself in a bent over row position, hips pushed back, back flat, your partner’s feet outside your knees. From this starting position pull your partners legs up toward your body and then slowly lower down before repeating for reps.
With a medicine ball, sit back-to-back with your partner with knees bent and heels on the ground. Hold this position throughout the exercise. Your partner should hold the medicine ball at chest height and, rotating from the upper torso, hand the ball to their right side. You will need to rotate left to receive the ball and then rotate to the opposite side, so your partner can accept the ball once again on their left side. Stand facing your partner either holding opposite hands or grasping each other’s wrists/forearms. Raise the same side foot as your partner and lean back a bit before sitting back and down into a single leg squat. From the bottom press up into a standing position being sure to push through your whole foot. Squat down as low as you are comfortable with and try to match your partner. Sit on the floor facing your partner while you both lean back supporting your bodyweight with your hands pressed into the floor behind your hips. Your legs should be close enough that your feet and ankles overlap for the exercise. To begin raise your legs up in the air with your feet together, and complete concentric circles as your partner simultaneously completes circles around your legs. Make sure to avoid making contact and increase the size of your circles to make the exercise more challenging! Planning your next gym date? Try this partner workout and share your sweaty selfies with us on Facebook, Twitter and Instagram. Tag @goldsgym and use the hashtag #goldsgoals.